John and I have been making lots of little changes around the house. 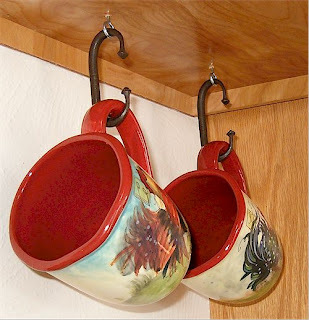 Most recently, we painted the light fixture above the sink and used some antique wrought iron drawer pulls we found at Jackalope to make cup hooks for the wonderful rooster mugs my aunt sent for Christmas. Believe it or not - my sink really is dish free and my counters are clear. 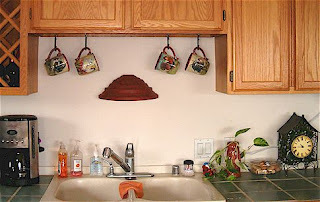 John also took an old over-the-door towel hook and modified it into a wall rack for the master bath. I'm currently working on a wall rack for a collection of beautiful ink bottles my sister sent for my birthday. We also have plans to create a coat rack for the entryway out of yet more wrought iron hooks we found at Jackalope.